If aliens ever visit our planet, their first impression could be that Earthlings are a messy bunch: There’s an estimated 7,500 tonnes worth of discarded satellites, rocket parts, and other debris currently floating in our planet’s orbit. Now, efforts are underway to clean it up. One such effort: RemoveDEBRIS. In April, the team out of Surrey Space Centre (SSC) sent its RemoveDEBRIS satellite to the International Space Station (ISS) aboard a SpaceX Dragon spacecraft; on Sunday the satellite launched from the ISS to demonstrate one of several debris-wrangling technologies. For this demo, the satellite released a shoebox-sized object to act as its target, then fired a spider-like web that wrapped around the box. 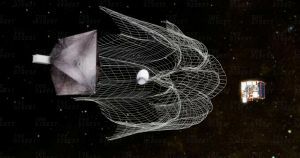 In a full-scale version of the technology, the net will remain tethered to the RemoveDEBRIS satellite so it could pull the captured junk out of the sky when it dives toward the Earth at the end of its mission. But since this was just a demonstration, both the box and the net will simply burn up in the Earth’s atmosphere within the next couple of months. Had the demo occurred higher up in the atmosphere, though, both would have continued to orbit the planet along with the rest of the space junk. In 2019, the RemoveDEBRIS satellite will demonstrate another technology — a harpoon that snares space junk. Russian scientists are also building a gigantic space laser to zap junk out of the sky, and NASA is working on a large, flat sheet it hopes to use to envelop debris. And, really, we have no time to waste. This debris already threatens the rockets and satellites already in commission. More cluttered space could make it difficult to launch new spacecraft. If that happens, we might be stuck hoping aliens do find us — after all, we won’t be able to go out hunting for them.